The Bag Boy Defender cart bag features a 14-way organizer top with reverse orientation for easy access to clubs, a rubberized putter well, a dedicated driver well and full length individual dividers for club protection. The bag also features 3 integrated ergonomic soft-grip lift assist handles; a fully integrated front umbrella sleeve; a towel holder; a Velcro glove holder; pen and divot tool holders; a rain hood; a cart strap sleeve that secures a bag to a cart without hindering pocket access and Top Lok technology, a patented bag-to-cart attachment system that securely locks a bag onto a cart to prevent it from twisting and turning. 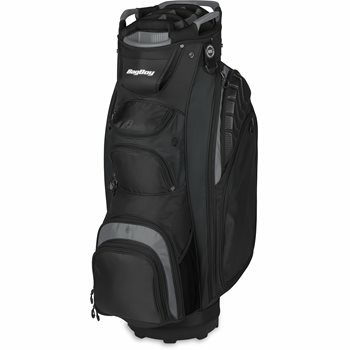 The Defender cart bag is equipped with 12 pockets (ten zippered pockets and 2 easy-access mesh pockets) that include 2 ABS hard shell fleece-lined pockets with organization compartments, 4 full-length garment pockets with an IGOTCHA ball retriever sleeve, an insulated cooler pocket, a GPS/rangefinder pocket, an accessory pocket and a large ball pocket.